As catchy as its opening theme was, music from the original Transformers cartoon has never had an official release. Hasbro and Legacy Recordings fix that grave oversight on March 9 with the release of Hasbro Studios Presents ‘80s TV Classics: Music from The Transformers. On vinyl, no less. People who follow me on Twitter may have noticed a recent surge in excitement over vinyl music. This is why. Cassette might have been more appropriate, but the thought of listening to the original Transformers opening theme on the crappy $40 portable turntable I picked up last week makes me so happy, I’ll let it slide. 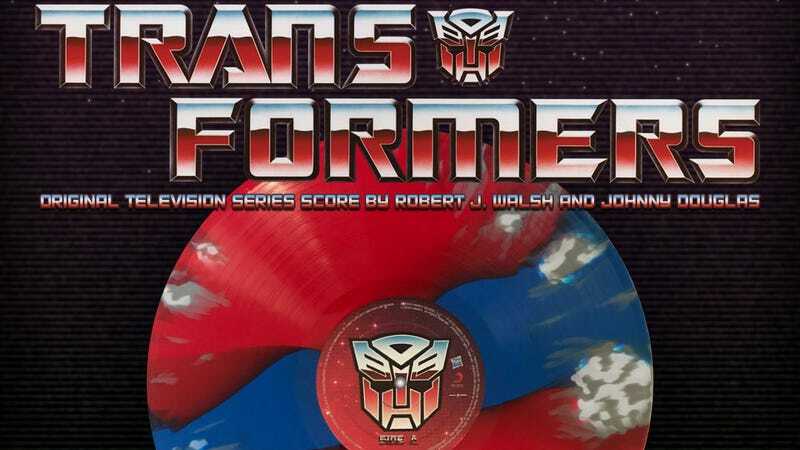 Hasbro Studios Presents ‘80s TV Classics: Music from The Transformers includes that opening theme, along with 45 minutes of unreleased music from composers Robert J. Walsh (who remastered the tracks from their original tapes), Johnny Douglas, Anne Bryant and Ford Kinder. The album spans seasons one through three of the cartoon, so we should be getting a nice mix of orchestrated tracks plus post-Transformers: The Movie synth magic. The album goes on sale Friday at noon Eastern time, and will be available in three flavors—Bumblebee, Optimus Prime and Megatron. Enjoy The Ride Records, partnered with Hasbro and and Sony Music/Legacy Recordings for the release, has the exclusive on the Optimus Prime and Megatron variants. Think Geek gets Bumblebee. All three versions will sell for $18.99. That’s pretty cheap for limited edition vinyl, so the 2,000 copy run is probably going to go pretty fast. And with that, I become the old bearded guy at the record store, flipping through vinyl stacks and muttering to myself. I have achieved my final form.